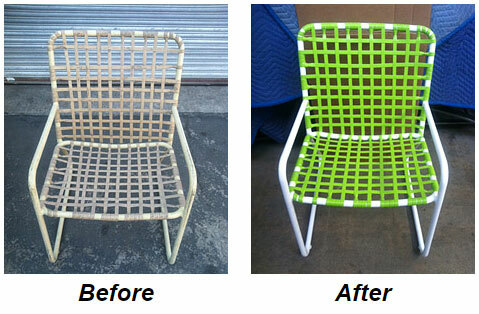 Refinish & Repair Your Patio Furniture Save Up to 70% Over Buying New! All Patio Furniture has refurbished and repaired commercial and residential patio furniture in Los Angeles and Southern California since 1985! We help all residential and commercial project owners compare the cost of refinishing vs. the cost of buying new. We’ll visit your home, office or hotel property to inventory and assess your furniture, show you frame, strap and a wide variety of fabric selections from which to choose, and provide expert guidance if you need it. And… you can expect a quote that day! With over 30 years of patio furniture industry experience, we find ways to save our customers money while simultaneously reducing our carbon footprint.